Americans are considered to be a competitive culture. Today’s media is major cause of this. Almost everyday there is some sort of competition on TV. It could be a cooking, building, art, or sporting competition. As I drive around the city I hear ads for best bar, best restaurant; I see ads for more sporting events or competitive social events like kickball or wiffle ball. Some of the biggest events of the year are the Super Bowl and World Series. Some of the highest paid jobs in the world are professional athletes. We are introduced to this idea of competition from an early age. My nephew just started playing soccer at the age of four. Now I’m not saying that competition is bad, I think it is healthy. I myself am a competitive person, I play in adult sports and social leagues and I also coach high school sports. Besides defeating an opponent, I think it’s important to talk about what else comes out of competition and that is the idea of a team and what makes a good team. 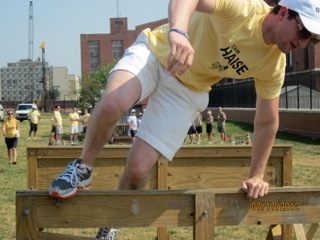 But can we take traditional competition and apply it to the challenge course and team building world? “This is challenging in a culture that likes to single out one person’s or groups accomplishment (ie. mvp, best actress/actor, etc. )” Marlo Scholz. A very large portion of the team building/challenge course community says, absolutely not or “I try to only use competition as a misdirection for initiatives” Scott Gray. When taught how to be a team building or challenge course facilitator most if not all people are told not to foster competition, I know I was. The idea of a winner and loser doesn’t sit well with most people, but competition can get people to focus and be present, instead of losing interest and disengaging from group tasks. “Competition can be helpful if it can be seen as a tool to help reach common goals and celebrate the overall group effort and outcome over the individual team or person.” Marlo Schulz. That being said, is Competition in Team Building a good idea? The answer is a group can come out to a team building event and have the fun and high energy of traditional competitive event and still learn as if it were a traditional team building event. Remember all good teams have a good leader, communicate well, trust one another, can problem solve together and are only as strong as their weakest link, just to name a few traits. Competition usually requires groups to come up with a quick plan and act on with little or no time to adapt the plan. That’s where the traditional team building can come in and give each group enough time to communicate and develop a plan each team thinks is appropriate. More importantly, after the event is done the teams can come together as one and reflect upon what each group did well to help better the team as a whole and to learn not to focus on the winning and losing. Finally the most important event, which is the last one should bring it all the way home. The teams that have been competing against one another now work together against the same opponent like the clock. Whether the group is successful or not doesn’t matter, what does matter is the team reflection and reminder to the team to take everything they learned in their small groups and communicate them in order that the group can be stronger as a whole. Even though they have been competing they are still one team. At Terrapin Adventures we have used friendly competition to focus groups, gain cohesion and increase the energy level and engagement. The groups that tend to get them most out of it are the high energy groups. On top of everything else these events tend to be the most fun. Our American society encourages competition so let Terrapin Adventures take that mentality and steer it in a helpful way to help better your organization. 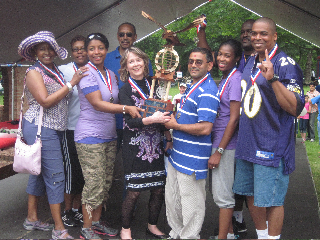 To learn more about team building or send an inquiry, click here or call us at 301-725-1313. All quotes are from team building professional from various parts of the world during various conversations regarding this subject matter. This entry was posted on Tuesday, February 3rd, 2015 at 10:00 am. Both comments and pings are currently closed.